Wow, a lot happened this week, and I think I’m experiencing a bit of whiplash, though that could be from one of the many slips I have taken in the copious mud created by the recent thaw. Ted here, to share the week’s update from Dancing Rabbit as we run up to the spring equinox. One of Dancing Rabbit’s newest inhabitants, delighted by the end of a baaaad winter. The nightmare of a cold winter, determined to thoroughly outstay its welcome, turned on a dime to the inevitability of spring. The spring birds all showed up at once. Unlike the past several years, when woodcocks started their “peent!” calls at dusk around my birthday in late February, this year I heard them on nearly the same day that killdeer and robins arrived. Meanwhile, the trio of bald eagles that have graced our local skies all winter are turning their grand circles on decidedly warmer updrafts. Our domesticated birds produced their first baker’s dozen of eggs this week as well — the daily count creeps steadily upward. I don’t love the extreme mud of the first thaw, especially when combined with heavy rains such as we have had lately. Among other inconveniences, this can mean that some sections of our road, which is nominally graveled, can turn into the most perilous pit of despair for all but our four-wheel-drive truck. I was called to rescue one of our cars, which got stuck in deeply rutted mud on an uphill section of Smith Road while attempting to reach blacktop. Some of our cars don’t have a good point to hitch a tow strap, even if you can get at the undercarriage, and in this case the vehicle was up to its axles, so the only way forward was to nudge it directly from behind, bumper to bumper. I doubted that even the truck could move forward, uphill in the mud against that impediment, but we succeeded in the end. Ben and Kim have been shuffling buckets full of maple sap back and forth on the path over the past few days. Ever since Alyson gave me a quart as a present during our first winter here in 2003-4, it has been a cherished birthday tradition of mine to drink some maple sap, but that too has been delayed as this has been one of the later years for the sap run. Ben was kind enough to let me steal a glass from one of his buckets (I’m not on the maple team this year), and it was the best thing I have ever tasted, all over again. Firewood stocking is now fully underway in the village. Kyle led some wood foraging forays to restock supplies for the boiler in the common building, and I pitched in a bit to help with the splitting and stacking efforts, though I am trying to figure out resupply for our home and kitchen as well — we just squeaked by on what I put up last year, along with some older stores. The knot in my neck after that first splitting effort reminded me that I have to work up to the splitting labor, even though I’m tempted to swing for hours right off the bat, it being one of the homesteading tasks I really enjoy. Troy had a tree service out to bring down a large elm that had long been a fixture over by the Timberframe (so named when it was the first and only such home on farm, in the previous millennium). The tree had been trimmed once before, but was growing ever larger, as trees are wont to do, and blocking solar access for the building as well as reaching a long arm out over Bella Ciao and its solar panels. I was sad to see it go, though it is gratifying to look around and see how much more woodsy the village has become, compared to when I first arrived in 2001. Elm doesn’t split easily, but it is decent firewood, so the more pliant parts of the tree will be put to good use, and Javi took on a lot of the brush for building hügelkultur beds out by the Gil family’s new garden area on Skunk Ridge. Hügelkultur beds, also known as hügelbeets, are raised, untilled planting beds made by burying wood in soil. The wood provides nutrients over time as it breaks down, while also becoming spongy and holding water for many summers to come, for the benefit of cultivated plants. Thomas has been steadily pruning all the fruit trees around his warren, and also spent some time in the common orchard with Freddi, one of the new recruits to the tree team, which looks after trees in public spaces. That lit a fire under my feet… I have managed to prune my biggest apple tree, but still have to get to the others this coming week. I did at last manage to get our first two trays of seeds planted in the greenhouse, and soon enough we’ll be digging in the garden; it is about time to put in onion starts even though the ground was hard frozen just a week ago. Dorothy departed midweek for some family time and knee surgery, so I’m coordinating forward progress on her house during her absence. I have also been at work full time building out the porch and starting on the finish floor upstairs, with electrical installations soon to follow. Good’s Construction of Rutledge began in earnest, busily installing the windows, doors and soffits, as well as the fiber cement siding and trim. Ryan, who earlier helped with framing and roofing, also pitched in on the flooring, and Prairie is lined up to help soon. St. Patrick’s Day, locally known as Bob’s birthday, brought lots of familiar faces to the Mercantile for a tasty supper of corned beef, cabbage, carrots and potatoes, followed by Alline’s extremely decadent chocolate-covered cheesecake. With Guinness and Killian’s in the house, I wasn’t missing anything, and we even managed to get Sara to our sit-down between two all-night midwifery jobs. Thankfully she is now sleeping at home. The Mercantile is one of our favorite places to spend time and enjoy a treat, and if you live within a reasonable distance, you don’t have to wait for a special occasion to come visit us because pizza is served every Thursday from 4PM to 8PM. The desserts alone are worth the drive — last Thursday was March 14th, pi day, so we celebrated π with a variety of pies, including lemon meringue, blueberry custard, chocolate cream and classic pecan. 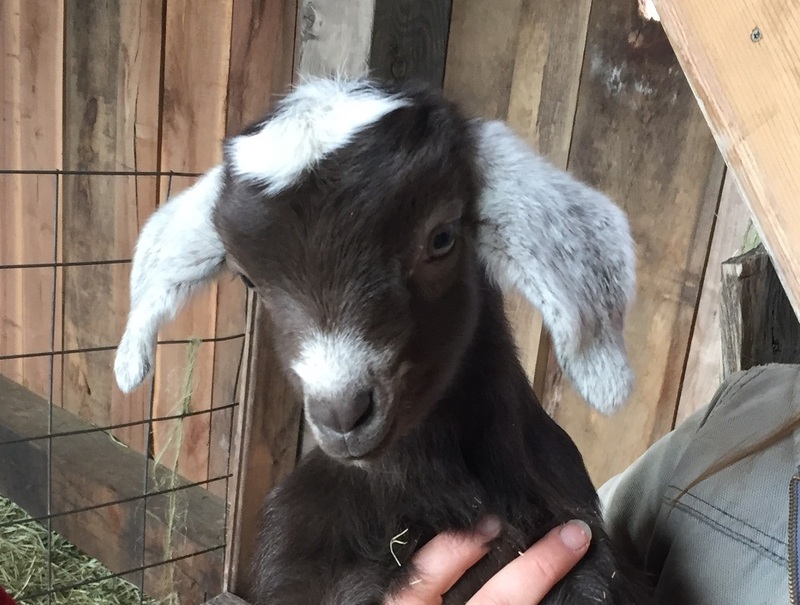 Curly Sue rounded out the last of this year’s additions to the goat herd with two cute doelings, and Mae pulled the final names out of the hat to complete the baby goat-naming raffle. Sparky christened the blue roan Plevna (which will be accompanied by a number of other honorifics, including Chadwick, in honor of our late Red Earth neighbor Chad’s birthday; we lost Chad this past year). Tereza, down in sunny Texas with Nathan, consulted with Aurelia and came up with Dapple for the thoroughly-spotted babe — that too came with some alternate names, including Jelly-leg in acknowledgement of its woozy first attempts to stand. Some of the wee goats have not been completely welcomed by their moms, so we have started a rotation of daily visits to the barn to bring some of the moms with surplus milk to the stand to let those little ones get in some nursing time. Aurelia has joined in the effort in my stead. Amazingly, when you rear a child for 12 years, she starts to give back, very capably! She has been doing more and more the past couple years and I’m grateful for her contributions to our family chores. Frisbee finally appeared on the schedule this week, though the field is recently thawed and will probably be too wet for full play. I can’t remember when I last threw a disc, and I know my legs are out of shape after dusting off my bike to ride over to Sandhill for a pruning session the other day. But I’m extremely excited at the prospect of regular Ultimate games returning to our lives in the near future. There are a few things (very few) I’m sad to say goodbye to at the end of winter, and the clearest is that with the thaw of the cattail pond, our neighborhood muskrat will likely move out of its temporary home in the culvert under the road in front of my house. It seems to have reached a detente with the cats, as I have seen Wallace and Gromit very near the spot where the muskrat slipped out of sight, entirely unperturbed, as though they had just been playing cards. I hope the arrival of spring brings you out of winter’s doldrums and into the warm sun, that your seeds germinate and grow happily in the coming weeks, and that the mud doesn’t stick to your feet — unless you like that sort of thing. The first session in our 2019 visitor program is coming up on April 14th, and you still have a chance to join in. You’ll learn lots of interesting information about our village, how we adjust our lives in many ways to live more sustainably, as well as how we govern our community. There will also be tons of fun, projects to participate in, delicious organic food, opportunities for personal growth and possibilities for new connections with wonderful people. Don’t wait too long to sign up, because slots can fill up fast, and you don’t want to miss out.